The Federal Acquisition Regulation (FAR) 15-204-1 specifies a uniform contract format for federal government contracts. You have encountered this format during the RFP stage of your procurement since the government is required to utilize it in structuring the request for proposal (RFP), leaving blank those items, which are subject to negotiation such as final contract pricing. Your contract is divided into four parts, with various sections within each part. Prime contractors issue subcontracts flowing down terms and conditions, pricing and other topics in an identical format. Like any other contractual document in the business world, the quality and content of this format will vary by agency and with the experience and knowledge of the contracting officer and the government administrative and technical support personnel preparing it or the prime contractor. It behooves your small business to examine the contents, research the appropriate sections of the FAR that may govern them and review them as commitments to which your organization can conform and perform before you sign your contract. The following is a listing of the items making up this format with a brief description of the contract parts and sections and some tips regarding each from a project management perspective. Name, Address, and Location of Issuing Activity, Including Room and Building. This is a listing by contract line item of the negotiated products or services and the prices for them in your contract. This section is very critical for billing purposes in your accounting system. Invoices to the government for supplies or services delivered must reference the items and all detail for the items contained in this section. Government requisition and appropriation data are contained in the contract line item detail and are carried throughout the government finance and accounting systems, to include the operations that make payment on your invoices. Perhaps the most critical section of the contract in terms of technical performance, this section describes the work to be performed and references requirements for the end product, including product performance. A tight, thorough statement of work (SOW) is the key to a well-understood relationship with your COTR, who will approve your performance against the SOW and sign off on your billings and invoices based on said approval. The SOW contains the benchmarks for defining the baseline effort required for the current contract price. One of the highest risks in government contacting is performance outside the statement of work, either due to a very general and loose SOW or by taking direction for added scope from government representatives without getting a contact change order modifying the SOW and increasing the price of the contract. With the vast amount of procurement the U.S. Government performs and the many locals to which the government directs shipments, it is necessary to specifically establish specifications for packaging and identification of products. The government considers this information important enough to establish a separate contract section for it. Your company should closely examine and comply with the instructions therein. This section identifies the government criteria for an acceptable product under your contract and the methodology that will be utilized by the government to perform inspection to insure the product quality. In many cases a specification will be called out. The place of delivery will also be specified. A discrete schedule by contract line item will be contained in this section. Requirements for time, place and method of delivery or performance will be specified. This section will contain required accounting and appropriation data and any contract administration information or instructions other than those on the contract form. It will specify your payment address if it is different than your company street address. Special contract requirements that are not included in Section I, Contract Clauses, or in other sections of the uniform contract format will be specified in this section. This section lists the title, date, and number of pages for each attached document, exhibit, and other attachment. The government may include documents that clarify or further define the contract. 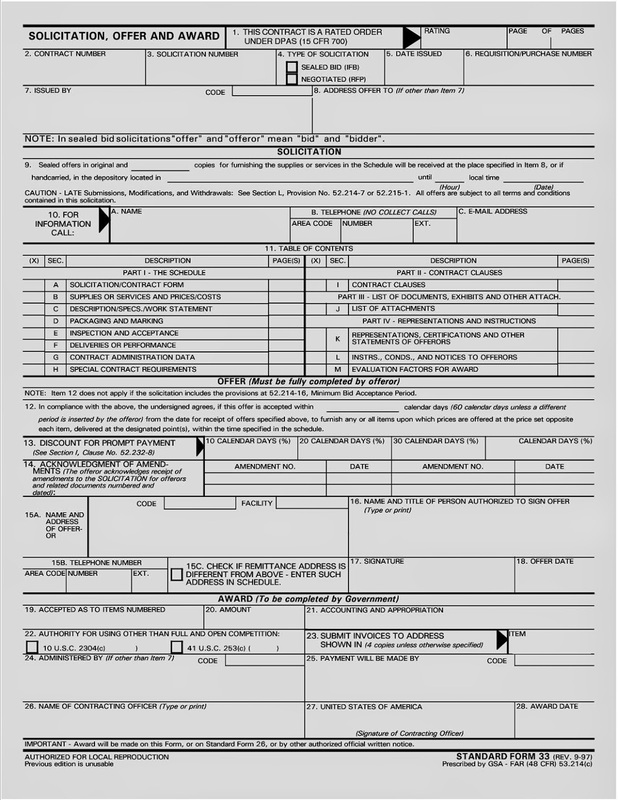 A commonly attached item is the DD Form 1423, "Contract Data Requirements List", that specifies for all data deliverables the Data Item Descriptions (DID's) and their delivery schedules. Lists of government furnished property in support of contractor performance on the contract are contained in this section if such equipment is provided. The federal government requires the contractor to certify to certain statements in bidding and performing government contracts. These signed documents become a part of your government contract when it is executed. Many of these "Certs and Reps", as they are commonly called, establish compliance with conflict of interest laws and establish the identity of the contractor by specifying information unique to the company such as NAICS Codes, CCR registration numbers, D&B Numbers, CAGE Codes and similar data. Minority-Owned Business and HUB Zone Business certification numbers are specified in this section, together with other small business self-certifications, such as Woman-owned, Veteran-Owned or Disabled-Veteran-Owned designations. Certain representations regarding sources for raw materials may also be required in Section K together with other agency-unique certifications such as facility and security officer information, security classification data and the like. You should establish and maintain your registration, certifications and representations, update them whenever necessary and insure that signed, paper copies of them are included in all your proposals for new work and in your contracts to the government.